If you didn’t gorge yourself yesterday on filet mignon, homemade lasagna or a lobster feast, well you’re doing it wrong. That’s what Restaurant Week is all about – indulgence. No, no actually it’s not. In reality, it’s about supporting local restaurants. It’s about FINALLY getting to try that local joint that’s been on your “I’ve heard so many great things about these places, so one of these days…” list. It’s about those high-end restaurants that normally cause your wallet to shed a tear at the very thought of dropping that kind of money on dinner but $20.13 is MUCH more affordable. It’s about taking a risk and trying a place you’ve never even heard of. It’s about rediscovering your neighborhood. 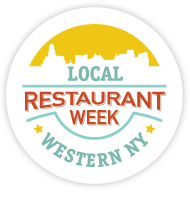 There’s close to 200 local restaurants participating in Restaurant Week – April 22-28. But be warned, you can encounter a slight case of vertigo sifting through the menus of each place so why bother? (Please note: if you choose to not heed my warning, please stay safely seated) Let me help you narrow down that list to 6 restaurants found in our hood – Hertel Avenue. 1.) Canvas@1206 – 4 words: Dark Chocolate Lava Cake. Not many of the restaurants offer dessert and the fact that Canvas has 4 dinner options, lava cake for dessert and a killer patio to boot makes it a solid option this week. 3.) Gramma Mora’s Mexican Restaurant – This place is legendary. I’m a firm believer that any chance you can get to dine here should be taken. 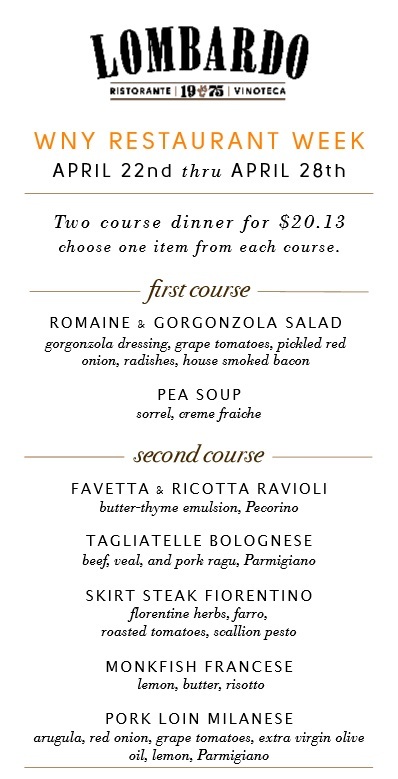 It’s Restaurant Week…that’s your excuse. 5.) Lombardo’s Ristorante – One of my faves in all of Buffalo. I’ve had the Tagliatelle Bolognese many o’ times so if you want ensure you’ve ordered a slam dunk, you need to be all over that. 6.) Shadow Lounge & Restaurant – Choice of appetizer, choice of entrée AND an alcoholic beverage. That’s worth repeating. Choice of appetizer, choice of entrée AND an alcoholic beverage. Yep.